Istrian Milk, or Istriana or Carsolina, sheep are milk sheep from the Istria and Karst regions of Italy. The Istria sheep breeders have traditionally bred domestic, autochthonous (indigenous) sheep which they called Istriana or Carsolina. Through the years they have bred Istrian sheep mainly for their unusual and distinct long-stepping walk and the ability to graze in rocky terrain. While they will graze even on dry old grass, they are quite skillful at finding fresh grass between rocks. Istrian shep are found in the provinces of Udine, Gorizia, Trieste (Friuli-Venezia Giulia - Italy) and Slovenia. Istrian sheep have quite a large frame with a highly placed torso and long strong legs. Their udders are shaped right, fastened high, with large teats. They have a narrow head, with the nose’s crest and jutting out ears, are placed on a long neck. Their wool is multicolored and does not cover their entire body. Their legs and belly are naked and in other parts they are only covered with shaggy fleece. 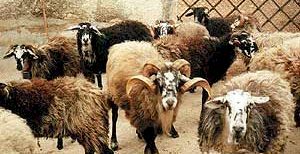 The Istria breeders bred white, black, spotted, patchy sheep, short-eared sheep, horned sheep, horn-less sheep, and the list goes on and on.